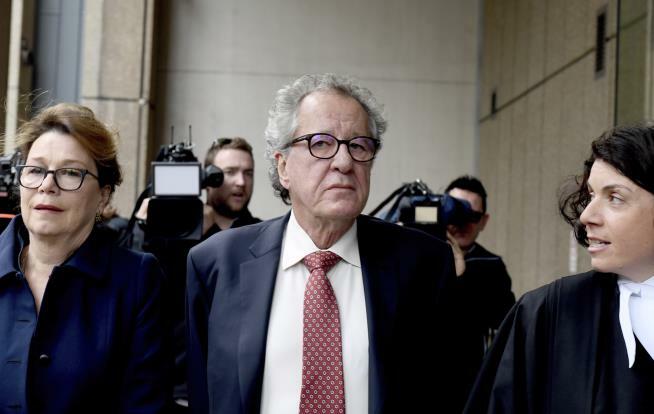 (Newser) – Oscar-winning actor Geoffrey Rush won his defamation case on Thursday against an Australian newspaper publisher and journalist over reports he'd been accused of inappropriate behavior toward an actress, per the AP. The 67-year-old Australian had sued the Daily Telegraph's publisher and journalist over two stories and a poster published in late 2017. Australian Federal Court Justice Michael Wigney ruled that Rush had been defamed. Wigney awarded an initial payment of $610,000 in damages, but lawyers will return to court on May 10 when the judge determines damages for economic loss and costs. The reports alleged inappropriate behavior toward co-star Eryn Jean Norvill by Rush while he was starring in the Sydney Theatre Company's production of King Lear in 2015 and 2016. Norvill, who played Lear's daughter Cordelia in the production, didn't speak to the newspaper before the articles were published, but she agreed to testify for the newspaper at the trial. The 34-year-old actress testified that while she was playing dead, Rush stroked his hand across the side of her right breast and on to her hip during a preview performance. Rush denied allegations that he deliberately touched Norvill's breast or her lower back under her shirt when they were backstage, or that he made lewd comments. The judge said he didn't find Norvill's evidence "credible or reliable," while he accepted Rush's testimony. "I never wanted these issues dealt with by a court," said Norvill. "This case has caused hurt for everyone." The Sydney Theatre Company has said Norvill complained of Rush's "inappropriate behavior" after the production ended. Most woman I have encountered are mental and unhinged, but the take away here is " evidence "credible or reliable,"" This is why statute of limitations are needed. Interesting. Not every accusation is true and since I wasn’t there to hear the evidence, I’ll reserve judgment. I will say it’s unusual, but that’s from an American judicial perspective of defamation. I have no experience or insight into their justice system there.